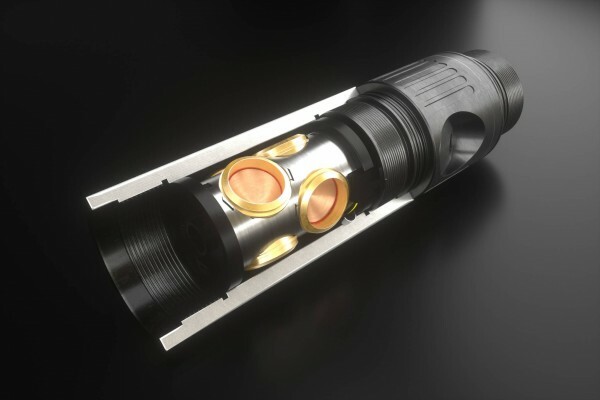 Millsap, TX – Feb 7, 2019 – GEODynamics, Inc. introduces the new patented HELLFire™ perforating system, a revolutionary solution that allows the oil and gas industry to more effectively complete multi-stage plug-and-perf operations. At 9.5-inches total length per cluster, the short-bodied HELLFire system eliminates tool string length and delivers more clusters per stage. Increasing cluster count per stage will make better wells, as differences due to same stage formation variation are mitigated. The compact HELLFire system incorporates the best unconventional perforating technologies into a single and versatile weapon to create next generation stage completions. HELLFire’s three- or six-shot cluster design delivers high-performing perforations specifically built for frac. This technology unlocks stage design options not previously possible with lengthy conventional spiral-phased technology. Flexible design options allow engineers to specify ideal cluster counts and spacings which result in lower costs, fewer stages, maximized injectivity, and optimal proppant placement, all with less equipment and a smaller crane. The factory-loaded, built for wireline system improves convenience, safety, and reliability, whether run with addressable initiators or with tried-and-trusted mechanical switches. “HELLFire is the ultimate perforating tool for high cluster count multi-stage, plug-and-perf completions,” according to David Ambler, Perforating Product Line Manager. Wireline providers have successfully run more than 7,000 clusters of the new system, proving that the HELLFire’s simple, compact, light-weight design gives operators and service companies an effective choice for constructing better wells. New optimized stage and cluster designs allow frac crews to get to rate quickly, every time, while still placing proppant where it is optimized. For more information on HELLFire and related perforating solutions from GEODynamics, visit http://www.perf.com or call 1 817.341.5300. GEODynamics, a subsidiary of Oil States International, Inc. (NYSE: OIS), creates and delivers downhole solutions that enable unsurpassed well economics, performance and lifespan. The company is the industry’s leading researcher, developer and manufacturer of engineered solutions to connect the wellbore with the formation in oil and gas well completions. GEODynamics’ solution-oriented product line spans the life of a well from advanced perforating systems (including its patented CONNEX® perforating technologies and FracIQ PRO™ Limited Entry Perforating Systems) to an innovative line of patented well completion tools and patented well abandonment tools (including ECLIPSE™ casing removal systems, ISOLOC™ annular perforating systems, bridge plugs and cement retainers, setting equipment, and jet cutters). GEODynamics has its headquarters, engineering, laboratory and manufacturing facilities in Millsap, Texas; technical sales offices in The Woodlands, Texas; Fort Worth, Texas; Denver, Colorado; Villa Hermosa, Mexico and Calgary, Alberta, Canada; nine U.S. warehouses; and additional international sales and support locations through regional partners. Be the first to comment on "New Short-Bodied Perforating System for More Effective Completions of Multi-String Plug-and-Perf Operations"